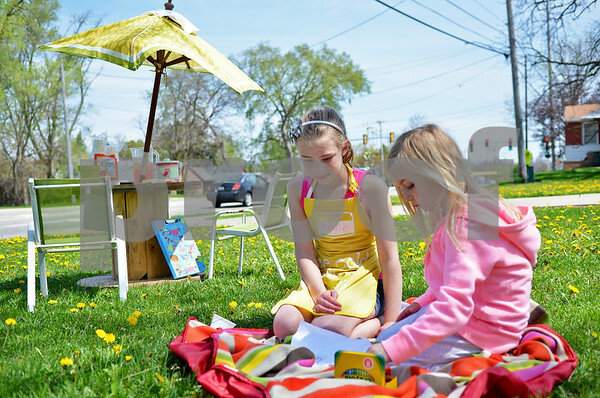 Madilyn Schermerhorn, 9, and sister Olivia Schermerhorn, 5, play behind their lemonade stand while waiting for customers in front of their family's home near the intersection of Sycamore Avenue and 13th Street in DeKalb on Saturday, May 10, 2014. The older Schermerhorn hopes to save enough money to buy souvenirs when she and her family go on vacation to Wisconsin this summer. One year, she saved the money she earned from her lemonade stand to donate to TAILS Humane Society.